Given all of that, I had two options: (1) to allow the appeal process to continue, which could extend into the coming year(s) the possibility of incarceration, or (2) to drop my appeal before year’s end, thereby becoming draft-eligible in 1970, and wait out the year’s final days. Given the unlikelihood of my having to refuse an order for induction during that brief time, the latter option should put it all behind me as of January 1, but it raised a new question of conscience: how did I feel about abandoning the C.O. case? It seemed to me that the Selective Service System’s objective was to force me to choose between killing and imprisonment. When those had been my only options, the choice had been obvious: the state could incarcerate me, but it could not coerce my conscience. Now, the lottery was offering a way to avoid both. Should I take that way out, or should I continue to press for official recognition as a C.O., now solely as witness against war and conscription? Although I had participated in protests against the war in Vietnam, promoting pacifism as national policy had not been my intention. My rejection of any and all war was a matter of personal conscience, not a political position: even when the counterculture seemed strongest, I understood that nonviolence was counter, a deviation from widely-accepted moral standards. My stance, I would later find, was similar to that of early Quakers, who in 1660 avowed that “All bloody principles and practices, we, as to our own particulars, do utterly deny, with all outward wars and strife and fightings with outward weapons, for any end or under any pretence whatsoever” [emphasis mine].21 Those Friends, however, had thought that the peoples of the world might soon be led to a radical change of heart that would bring lasting peace. I had no such hope. Nor had conscription itself been a target of my refusal. I had cooperated fully, asking only for “alternative civilian service,” non-military work for the common good. From the outset, I had conceived the situation starkly: I was being ordered to maim and kill, and that I could not do. I saw, too, that as a free man I could work for human welfare in ways that were more productive than submitting to imprisonment. And without the ever-present worry about prison, I should be less depressed and anxious and therefore more able to engage in such work. I decided that I would accept the lottery’s offer of immediate liberation, but without recanting my declaration of pacifism. On December 22, 1970, still classified as 1-A, I sent a registered letter to the local board, informing them simply that I was withdrawing my appeal and was therefore subject to the 1970 lottery. Someone at the board — not Elizabeth Simmons — signed for my letter on the following day. Saddened, I cut short my stay in Boston and returned to Baltimore. When I arrived home and saw the signed return receipt from the draft board, my relief was akin to that I had felt when Father X rescued me from hell. Although I was broke, alienated from my family, and soon to be homeless, I was free. And my conscience was largely intact, even if, as earlier with the “habitual sin” escape clause, deliverance had been attained in a way that felt too easy. 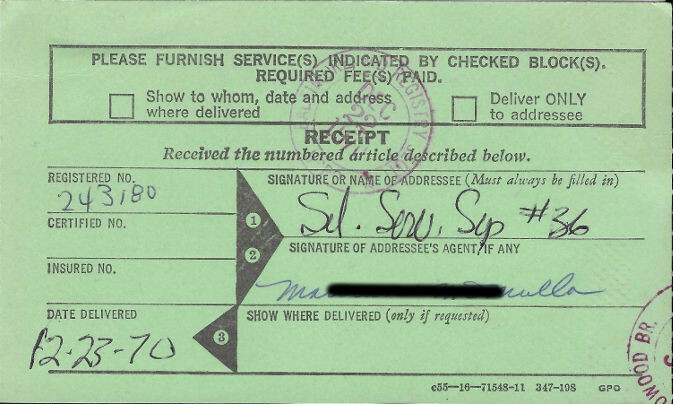 When my final draft card arrived, it bore the classification 1-H, “not currently subject to processing for induction.” “‘Not currently,'” I said as I signed the card; “they never give up hope.” But I knew that, like the Catholic Church before it, the Selective Service System had lost its power to imprison me.
. Although I had been classified as 1-A, “available for military service,” during the year, I could not be drafted until all properly requested hearings and appeals had been completed.
. From “A Declaration from the Harmless and Innocent People of God, Called Quakers … .” Available at http://www.qhpress.org/quakerpages/qwhp/dec1660.htm.